Caption slip reads: "Photographer: Paegel. Date: 1957-11-01. Reporter: Brown. Assignment: Litter. Special Instructions: Monday. Shots (posed) of motorist dropping trash out window at Bellevue Ave and Echo Park Blvd. 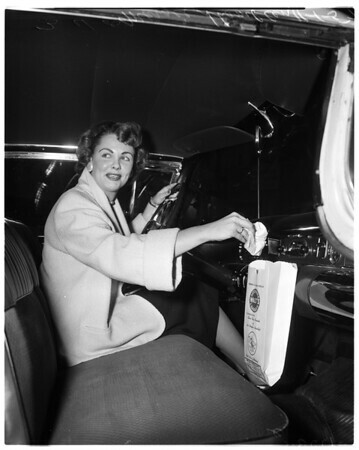 Margie Shamblen demonstrates correct way to avoid being a litterbug by using litter bag in car. Monday".